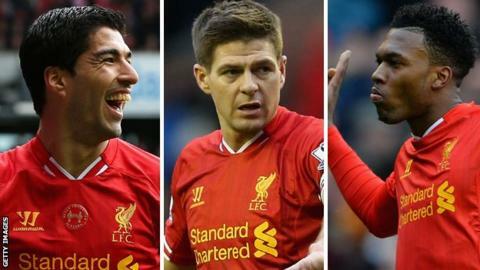 Liverpool trio Luis Suarez, Steven Gerrard and Daniel Sturridge have been nominated for the Professional Footballers' Association's player of the year award. Manchester City midfielder Yaya Toure, winger Eden Hazard of Chelsea and Southampton playmaker Adam Lallana complete the list. Sturridge and Hazard have also been nominated for the young player award, along with Liverpool's Raheem Sterling, Arsenal's Aaron Ramsey, Everton's Ross Barkley and Southampton's Luke Shaw. The winners will be announced at a ceremony at the Grosvenor House Hotel in London on Sunday, 27 April. Uruguay striker Suarez, 27, heads the Premier League scoring charts, netting 29 league goals for top-of-the-table Liverpool. His strike partner Sturridge, 24, has scored 20 Premier League goals while captain Gerrard, 33, has contributed 13 goals and 11 assists for the free-scoring Reds. Ivorian Toure, 30, is Manchester City's top league scorer with 18 goals from 31 appearances, while Chelsea manager Jose Mourinho acclaimed Hazard, 23, as "the best young player in the world" in February after the Blues' 1-0 win over City at Etihad Stadium. Lallana, 25, has been the standout player for Southampton this season, and made his England debut against Chile in November. His Saints team-mate Shaw, 18, made his international debut against Denmark last month and is vying with Chelsea's Ashley Cole and Leighton Baines of Everton for a place in England's World Cup squad. Winger Sterling, 19, won his second England cap in the 1-0 friendly win over the Danes and scored Liverpool's first goal in Sunday's 3-2 win over title rivals Manchester City. Wales international Ramsey scored 13 goals for Arsenal before a thigh injury in December forced the 23-year-old out of action for three months. He returned to the Gunners side in their defeat by Everton on 6 April. Barkley, 20, earned his first senior England cap in a World Cup qualifier against Moldova last September and was recently called "a rare talent" by Everton manager Roberto Martinez.